Abstract: Based around the very popular VIA K8T800/VT8237 chipsets, the bright blue Albatron K8X800 Pro II supports Socket 754 Athlon64 processors. The AMD Athlon64 was probably one of the most anticipated processors in history. It has the potential to revolutionize the computing industry, and it marks one of the few times that AMD has really out done Intel big time. Now that the Athlon64 has finally been unveiled, manufacturers can strut their stuff, and earn themselves a name when it comes to 64-bit computing. As virtually none of the corporate computer makers (Dell, HP, Gateway) are selling Athlon64 systems yet, preferring instead to launch their systems when the Athlon64 CPU supply improves and WindowsXP 64-bit Edition is on the market, the field is wide open for mainboard manufacturers. A setback for AMD perhaps, but one in no way tied to any perceived lack demand for Athlon64 chips from consumers. For a company just over a year old, Albatron has staked a name for itself under the leadership of CEO Jack Ko as a pioneer when it comes to adopting new technology. 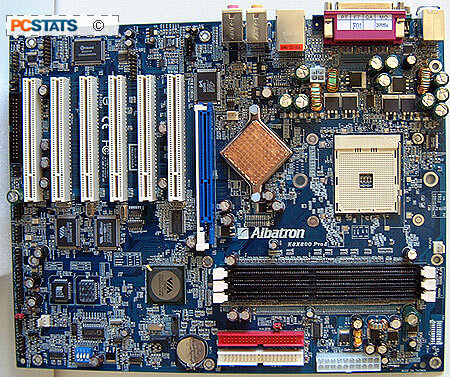 Since its inception, Albatron has produced a good many enthusiast-friendly motherboards, and so many users have been patiently waiting to see what Albatron has to offer before jumping into an Athlon64 motherboard of their own. 2x Ultra133 Cables, Serial ATA Cable, Serial ATA Power Cable, FDD Cable, Driver CD, Wincinema Pro CD, I/O Back Plate, Users Manual, Quick Installation Guide. Brackets:USB, IEEE 1394, Audio and Game port. Based around the very popular VIA K8T800/VT8237 chipsets, the bright blue Albatron K8X800 Pro II supports Socket 754 Athlon64 processors. The three DIMM slots can handle up to 3GB of DDR333 RAM, and 2 GB (or two 1GB sticks) of DDR400 RAM. In either case, both memory types run in a single channel memory configuration. 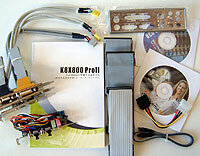 In terms of onboard goodies the K8X800ProII motherboard boasts a 3Com Gigabit NIC, SATA, IEEE 1394, VIA's 7.1 audio and dual BIOS's for extra reliability. Upgrading is easy with the K8X800's lone 8x AGP port and six PCI slots.